Don’t you wish that adults could get snow days too? I mean, why do the kids get all the fun stuff? Where we live we get snow and lots of it so, instead of complain about it we might as well embrace it right? When I was a little girl there was nothing more magical than waking up on a school day to find out the school had been canceled and we had the entire day to play in the snow. Who doesn’t love a day off? But as a mom to four I know that kids can easily get bored and even I struggle to come up with ideas to keep the kids occupied all day. It’s way too easy to just let them “veg” on the couch in front of movies or video games. I have to confess when we crawled into our beds last night under a blanket of snow I found myself wishing that we lived somewhere that actually canceled school. Yup, I said that out loud. I wish my kids got a chance to experience snow days like I did when I was a kid. So, I am ready this winter with these fun, creative, simple activities that will keep not only my kids busy but yours too. 1.) Build a living room fort using blankest, couch cushions and pillows then hide inside and play board games. 2.) 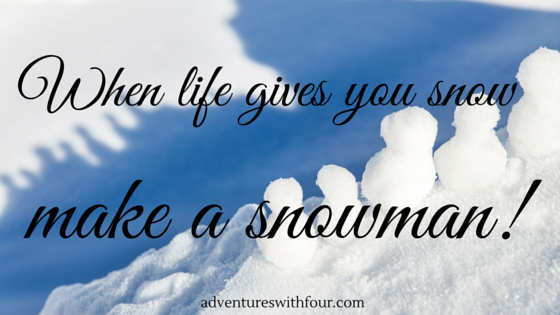 Get outside and make a snowman you know the saying…if life gives you snow..make a snowman! Make sure to check out sometimes creative for this adorable snowman kit! 3.) Make bird feeders using pine cones, bird seed and peanut butter then go for a walk in the trees and hang them for our feathered friends. 4.) Host a board game marathon with all those games you have hidden in the crawl space in the basement. 5.) Be a snow angel and shovel the driveway of one of your elderly neighbours. 7. )Have an indoor picnic but make sure not to forget the hot chocolate! 8.) Make some homemade play dough and drag out all of those cookie cutters you have meant to use. 9.) Curl up with a good book! or a couple of them…cuddle on the couch and read as many stories as you can muster without falling asleep. 10.) Get outside and search for tracks in the snow you never know came calling until you go and look! 11.) Skype or facetime Grandma and Grandpa and have a video chat the Grandparents would LOVE to hear from the grandkids! 12.) Bring the snow INSIDE!! Grab a few buckets of snow and put it in a small plastic tub. Make sure the kids put on mittens and let the play. This way you don’t have to worry about them getting too cold and the mess is minimal. 13.) Go sledding or skating! Don’t forget to Pick up some hot chocolate and dress warm..you can’t have fun if your cold. Bring your camera too! 14.) Check out some snowflakes is easier to do than you think.. all you need is a magnifying glass and some dark fabric. 15.) Have a Lego building contest. How do you keep cabin fever at bay? 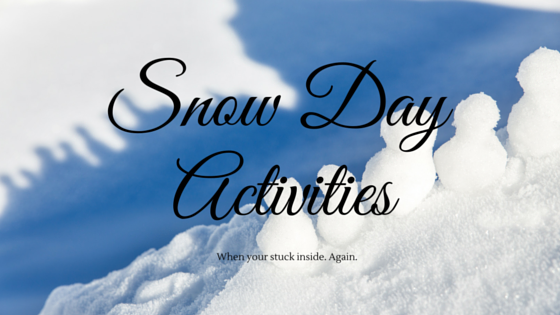 What is your favourite snow day activities? Wow – snow days. I am not quite ready to think about that although we did break out the Party Snow last weekend. But either way this is a nice list to refer back to when it finally does snow! Those are great activities! Unfortunately, we do not get much snow in Texas. Fantastic ideas! I hope we get some snow days this year on Colorado! I really like the idea of the game board marathon. I haven’t played a board game in too long. I don’t even wanna think about snow yet! But my kids are already hoping for flakes. 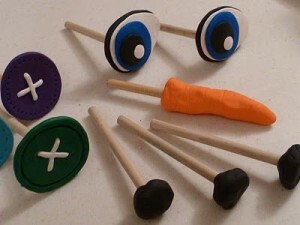 I love that snowman kit- we’re going to make that this school holiday in anticipation! These are great ideas. My kids were always excited about snow days when we lived on the East Coast! You definitely have to take the opportunity to build a snowman or a snow fort when the snow is just the right texture. Snow angels are always fun too! This is a fun list of really different ideas to keep the kids occupied (and not fighting) on those upcoming snow days! I really like the idea of helping out the neighbors with shoveling driveways and porches. We live smack dab in the middle of several elderly couples so there is no shortage of people who could use the help! When my daughter was younger, we lived in FL where we had hurricane days. Indoor picnics and board games were 2 activities that saved this mom’s sanity! I can’t even imagine a hurricane. They scare the daylights out of me to be totally honest with you! I live where it is warm now, but before that I lived where there was a lot of snow. My favorite thing was baking when it snowed. My son on the other hand would love to make a snow fort.